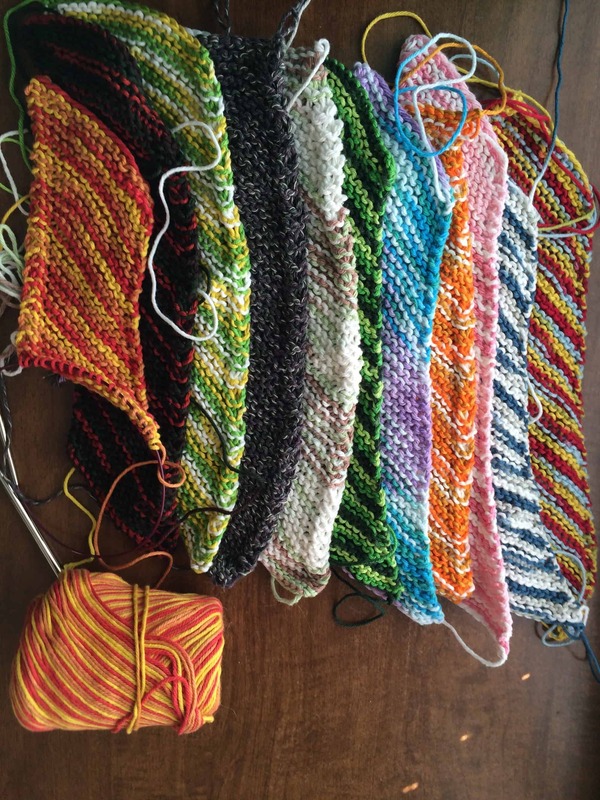 In the spring of 2010, I joined a Traveling Scarf group on Ravelry. The idea was that each person in the group knit the first 4 to 6 inches of a scarf. The scarves were mailed round robin style through the circle and eventually your own, now complete, scarf came back to you. Unfortunately, my group fell apart without completing the entire project. 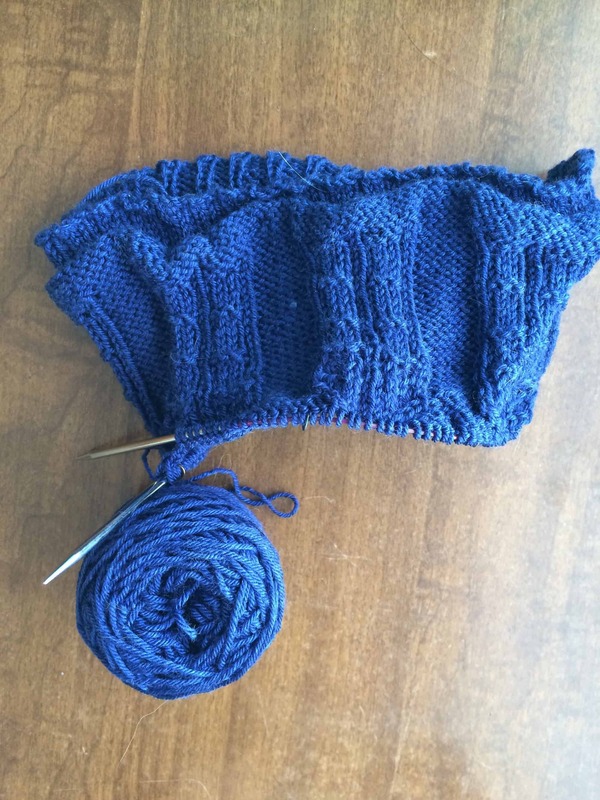 In late 2013, I got back my partially finished scarf. I’m honestly not too sure what to do with this. I’m thinking I might ask some local knitting friends to knit a section. 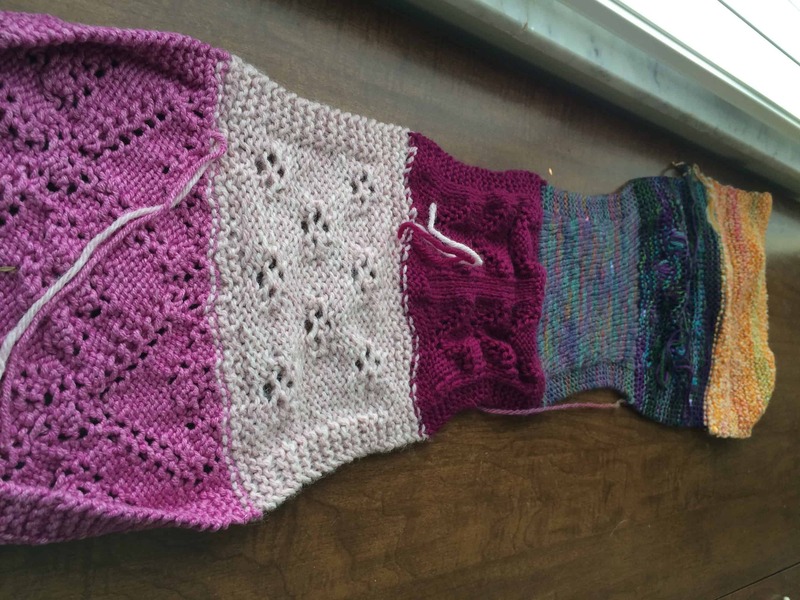 If anyone reading this blog is interested in knitting a section, e-mail me: karen at yarnycurtain dot com. I first proposed this shawl as a HPKCHC Ancient Runes OWL in the Fall 2010 term. It was intended to be a gift for my mother, who asked for something she could wear to formal events. 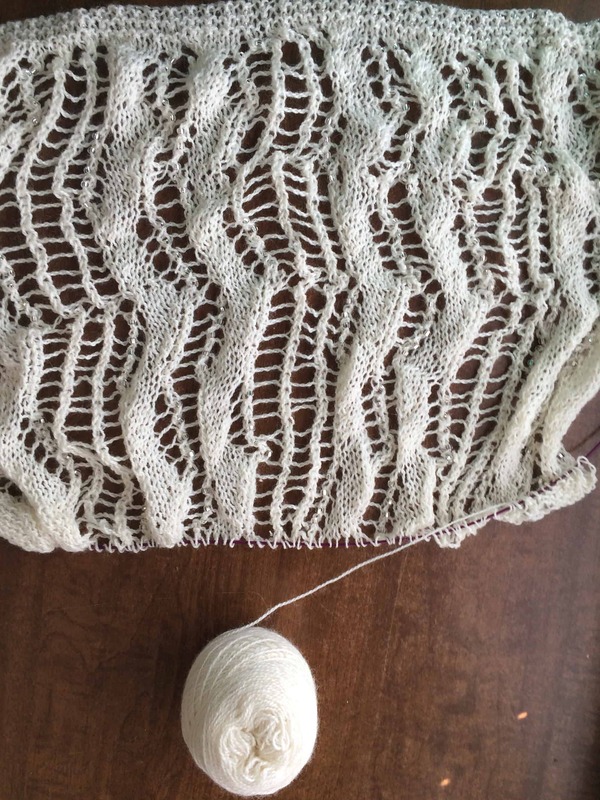 As I knit it, I thought it looked too bridal and I set it aside. I’ve knit perhaps 1/8 of the shawl. I decided that I am going to go ahead and finish this project. The yarn is Knit Picks Bare, which means that I can dye it after I finish knitting. When I first started on this project, I did not know how to dye. Now I do. I can let my mom pick her color! 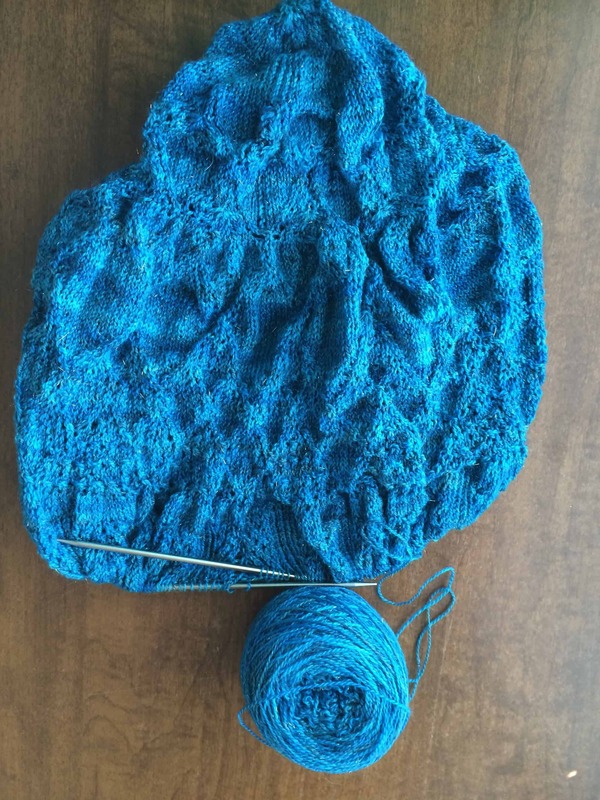 In 2013, I knit a Bigger on the Inside shawl, at the request of my sister, for one of her friends who was undergoing chemo. I finished the shawl, then decided to try to make a matching hat, using the TARDIS chart from the shawl pattern. I hadn’t knit a hat before and while it is coming out hat-shaped, it is probably too small for an adult. I put the hat aside because I wasn’t sure if I wanted to finish it or not. I’ve decided that I will try to finish it, measure and adjust to see if I can come up with an adult-sized version. Evenstart is another failed Ancient Runes OWL, this time from Fall 2013. 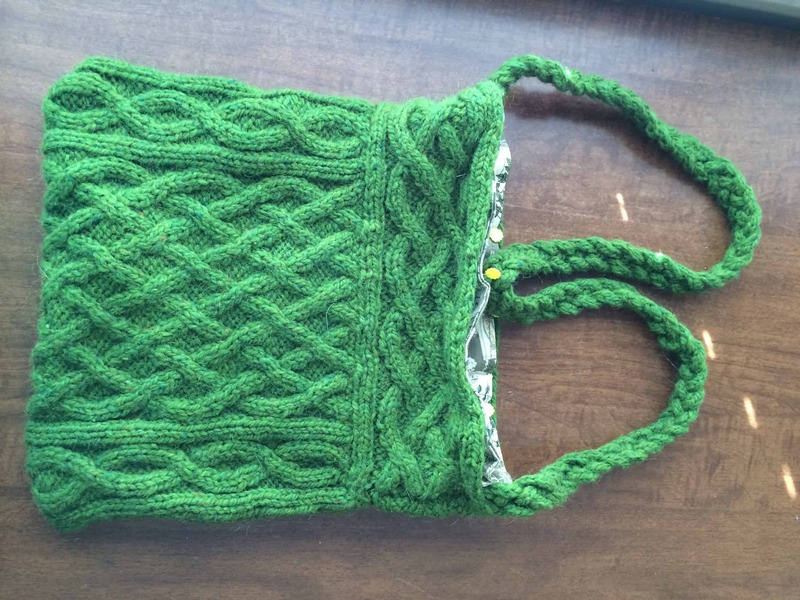 I love the pattern and the yarn. I was just knitting slower than I needed to knit in order to finish it and allowed myself to be distracted by shiny new projects rather than finishing. It is about 40% complete and I will be finishing it before April. I made 9 Quinn Bags for Christmas 2013. Eight were presents; the 9th was for me. I finished all of them except mine. All the knitting is done, the handle is sewn on, the lining is sewn and pinned in place. I just need to sew the lining into the bag. It’s less than an hour of work. I kinda forgot about it. I’m putting it on my list to finish next week. 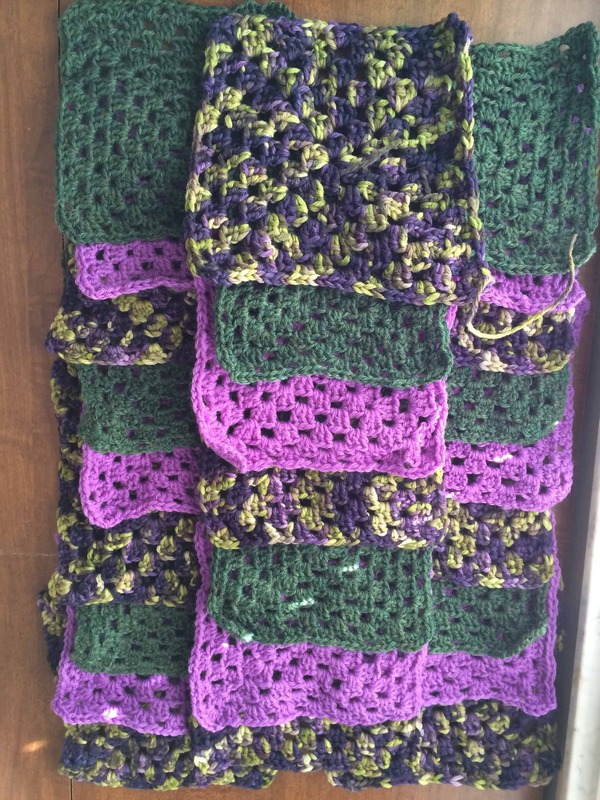 I crocheted these squares throughout 2014, but haven’t sewn the blanket together. I have a problem because I think I accidentally changed hook sizes in the middle of this project. Either that or as my crochet improved, my gauge loosened. There’s significant size differences between squares and I’m not sure the best way to assemble it as a result. I might need to frog and redo some of the squares. I’ll get to it. Really. I mean that. I cast these on in October 2014 as part of my (failed) Arithmancy OWL. 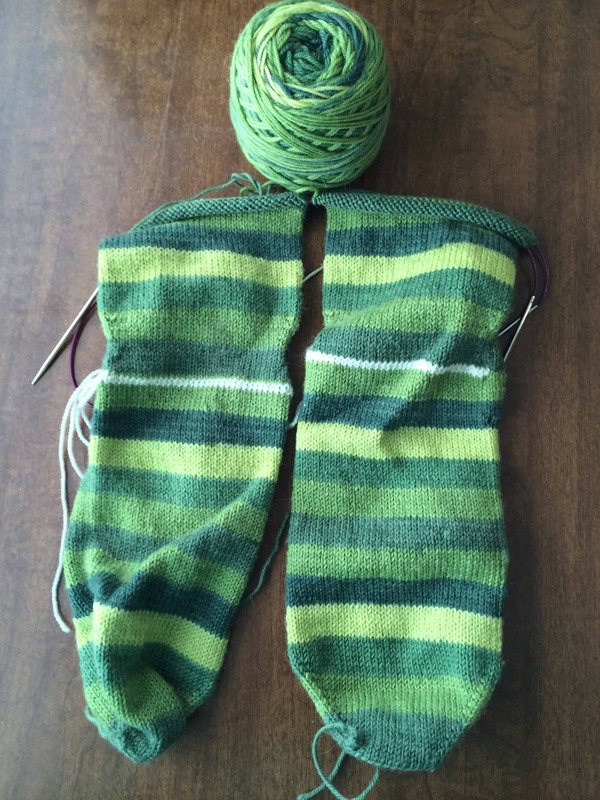 They’re almost finished — three more stripes on the legs and then the heels. I will be finishing them sometime in the next couple months. I started these in October or November 2014, but put them aside due to holiday distractions. I expect I will finish them up next week. I still haven’t woven in the ends on #8 or finished knitting #9. And I need to dye them all. I’m not including a picture because there’s been no progress since the last time I blogged about them. And that’s all folks! Nine (or so, depending on how you want to count the scrubbies and MAPLE LEAF shawls) UFOs plus 3 WIPs. Only 12 projects on the needles / hook / wheel / loom. I honestly didn’t realize it was so many — which is exactly why I did the inventory. If I didn’t inventory, who knows when I would have remembered the Quinn Bag? Now that I know where I stand, I can make a plan for finishing every one!